The Efest LUC V4 is a 4 slot LED charger made by Efest power. It is compatible with most 3.7V batteries. This great charger comes equipped with several awesome features that make it a must-have. There is a reverse polarity protection, an over-current protection and also a zero voltage activation function also. Not to mention, there are 2 USB ports so you are able to charge other electronics such as cell phones and tablets with these versatile chargers. Also comes with a car charger so you can charge on the go. 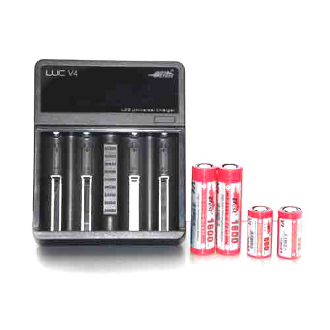 The LUC V4 charger is compatible with most 3.7V Li-Mn or Li-ion batteries like 10440, 14500, 14650, 18500, 17670, 18650, 18700, 26500, 26650 etc. There are 2 USB ports, which means that with one full charged battery in charging bay 2, the LUC V4 charger can also charge devices such as mobile phones, iPad, MP3 players, etc. Built-in reverse polarity protection: While the charger is connected, each charging channel has reverse polarity protection, the charging light is still green and will prevent any short circuit. Over-charging protection: Once the external power is connected with the LUC V4 charger, the charger will stop charging when batteries are full. Use Rechargeable Batteries or With PCB Batteries. Other types of batteries may cause personal injury or battery damage. Do NOT leave batteries charging unattended/overnight!